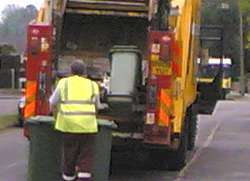 Due to the Bank Holiday, alternative arrangements have been made for refuse, recycling and garden waste collections on Monday, 29th August 2011. A full refuse, recycling and garden waste collection will be provided on Saturday, 27th August 2011 in lieu of the August Bank Holiday Monday collection. If you normally receive a Monday collection please ensure your refuse bin and either your recycling or garden waste bins/boxes are presented for emptying by 7.00am on the Saturday morning. Please refer to your collection calendar leaflet for further information (also available using the bin collection day search below). All Council Offices will be closed on Monday, 29th August 2011. People can telephone the waste hotline on 0116 272 7555 for refuse and recycling queries on the Saturday 27th August prior to the bank holiday Monday. Please note that Whetstone tip is open as usual for the whole bank holiday weekend, including Monday (8.00am to 8.00pm). If you need the emergency, out of hours, dog warden service, please phone 07823 533 290.